ASU station archeologist Dr. Juliet Morrow in the trench at the Old Town Ridge site in northeast Arkansas, showing stratigraphy. From its earliest days, archeologists have made use of principles and methods drawn from earth sciences. Stratigraphy, a basic concept of earth science, helped create archeology by showing that things deeper in the earth are older. Other examples springing quickly to mind include the identification of animal and plant remains retrieved from archeological sites, and study of landscape alterations (mounds, earthworks, agricultural fields, roads and canals, etc.). Today, archeological applications of earth sciences are extensive, providing advancements in field as well as in lab studies. Topics include understanding the landscape contexts of archeological materials, identifying specific source locations and contexts for raw materials, detecting buried archeological features, chronometric measurement, identifying and studying craft and manufacturing technologies used to produce finished artifacts, assessing human impacts on landscapes, measuring impacts of a wide variety of earth processes on human settlements and land uses, to list only a few. Examples from Arkansas archeology show that we draw extensively upon earth sciences to help us better understand the evidence of ancient human activity. We’ll begin with ecology and life sciences operating at or near the earth’s surface. 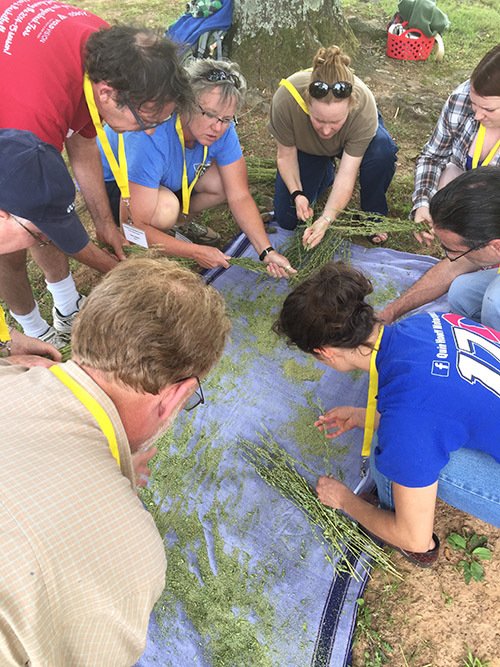 Ethnobotany students work with Elizabeth Horton on an experiment processing goosefoot (Chenopodium berlandieri) from the Plum Bayou Garden. Paleoethnobotanists study how ancient people used plants for food and a variety of other purposes. Back in the 1970s and 1980s, research by Gayle Fritz (Washington University in St. Louis) and Bruce Smith (Smithsonian Institution) on ancient plant remains preserved in dry Ozark rock shelters led to the discovery that American Indians living in Arkansas domesticated several locally growing wild plants, including sunflower, lambs quarters, erect knotweed, sumpweed, maygrass, and little barley, to produce nutritious garden crops, collectively referred to as the Eastern Agricultural Complex (EAC). More recent studies that bring to the table new analytic tools, such as the examination of ancient DNA, provide better information on how ancient Indians domesticated those plants and how, after subsequent replacement by other crops including corn, they eventually went extinct. Based on those studies, current ARAS staff, including Elizabeth T. Horton (Toltec Mounds Research Station) and Emily Beahm (Winthrop Rockefeller Institute Research Station) created educational and research garden spaces where modern, wild versions of ancient EAC plants are cultivated. These gardens illustrate for modern visitors the crops developed by Arkansas Indians before their adoption of Mesoamerican corn, beans, and squashes. Perhaps not altogether surprisingly, the plants in these modern gardens have begun to change, offering yet another avenue for investigation of factors involved in plant domestication (Mueller et al. 2017). In addition, the Plum Bayou Garden provides seeds to other researchers and raw materials for experimental archeology. Another application of modern plant science is illustrated in Ann Early’s examination of the remains of ancient dwelling timbers preserved in archeological contexts at a Caddo site in the Ouachita Mountains. Her essay “The Caddo and the Forest” (Early 2000) makes a case for the use of Osage Orange or bois d’arc (Maclura pomifera) at the Winding Stair site some time during the fifteenth century. This identification, supported by scanning electron microscope examination of the cellular structure of archeological wood remains, contributed vital information to ongoing discussions of the ancient distribution of that tree species. These findings also contributed valuable new knowledge about the architectural properties of that wood species. 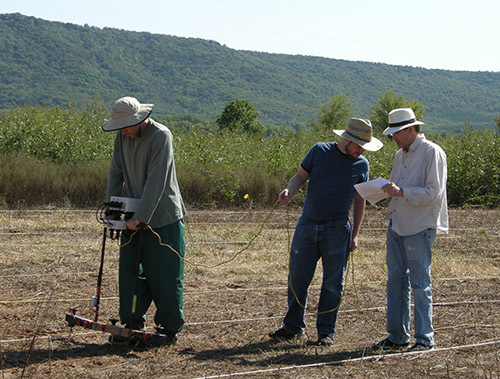 Duncan McKinnon, John Samuelsen, Jami Lockart with GPR at Carden Bottoms site in central Arkansas, 2013, where house outlines, hearths, and other features were discovered underground. The advent of near-ground, geophysical remote sensing has had a dramatic impact on how we go about doing archeology. The ARAS began to employ ground-penetrating radar, magnetometry, electrical resistivity, electromagnetic conductivity, and magnetic susceptibility in the late 1990s under the direction of Dr. Jami Lockhart, to discover the locations of buried archeological features. Each technology detects a specific kind of anomaly in buried sediments, and sometimes the combined results of a multi-sensor survey can reveal a great deal about the structure of an ancient settlement, providing site-wide context for specific anomalies such as refuse pits or house floors. Excavation units can also be placed directly over suspected features, greatly improving the efficiency of field investigations. Novaculite boulder and chipping debris in a quarry trench, Montgomery County, Arkansas. Another below-ground property, involving trace elements in various sedimentary deposits, provides benefits to archeology. For example, clays used to produce ceramic vessels contain trace elements in proportions that are distinctive to the localities from which they were derived. 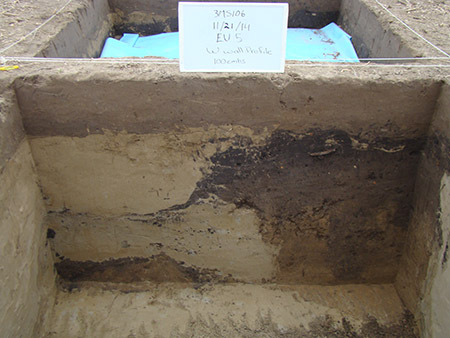 A scientific laboratory technique called Instrumental Neutron Activation Analysis (INAA) is used to identify regional trace element profiles, thereby allowing archeologists to distinguish between locally produced ceramics and wares produced elsewhere. In Arkansas, Mary Beth Trubitt and colleagues employed INAA to reconstruct ancient trade and exchange patterns linking southwest Arkansas Caddoan communities with Cahokians living in the famous Mississippi period mega-center near modern St. Louis (Trubitt et al. 2016). Study of the distribution of specific geological resources also provides helpful frameworks for archeological study. 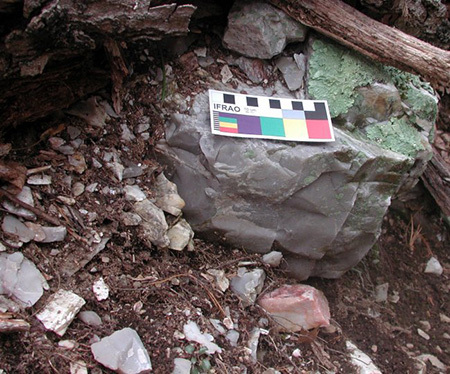 Novaculite deposits that occur in various exposures across the Ouachita Mountains in southwest Arkansas are favored today by modern crafters of whetstones; this material was also an important resource for ancient Indians who used it for the manufacture of a wide variety of stone tools. Dr. Trubitt and her collaborators have examined the use of this material through time, and have created an interactive website where colleagues can enter information on the locations of novaculite artifact finds, providing a valuable means for tracking the geographical distribution of this distinctive material. Wall of excavation unit over crossed earthquake cracks at the Manly-Usrey site in NE Arkansas; light material is sand from a sand blow, dark material is midden from an ancient living surface. Photo by Michelle Rathgaber. High-magnitude earthquakes pose a frequent threat to many communities today, and especially in areas with high population densities and susceptible infrastructure including roads, bridges, and buildings. Earthquakes posed comparable threats to many ancient civilizations. In northeast Arkansas and adjacent portions of Missouri and Tennessee, hundreds of earthquakes occur annually in the New Madrid Seismic Zone (NMSZ). Most go without much notice, though from December 1811 to February 1812, an extraordinarily powerful quake was felt throughout a 5 million square kilometer area, reshaping extensive tracts of land and, for a brief period, reversing the flow of the Mississippi River. In this region of deep alluvial sediments, one consequence of strong earthquake activity is the liquification of loose, unconsolidated sand deposits, which erupt in geysers that blanket surrounding areas and simultaneously produce sunken areas as the ground surface collapses over areas where underground sand deposits are projected upward. Michelle Rathgaber, a doctoral student in the University of Arkansas’s Environmental Dynamics program, and Dr. Julie Morrow and colleagues are currently involved in research to determine how Mississippi period Indians living within the NMSZ responded when those events affected their communities. Earth’s geomagnetic field, a property of the dynamics between the solid inner core and the volatile outer core of liquid iron, provides the basis for chronometric measurements based on geomagnetic dating. On a very large scale of resolution, the relative ages of continental plates, seabed features, and other planetary phenomena can be determined. Archeomagnetic dating, pioneered in Arkansas during the 1970s by Dr. Daniel Wolfman, is a finer-resolution application that can be applied to dating certain archeological features, such as hearths, that have been fired to a sufficient degree to “lock in” the direction of the magnetic north pole at the time of firing, and not subsequently disturbed. Age determination is based on the difference between modern and ancient magnetic north pole locations, involving a reconstruction of the rate and direction of polar movement through time. 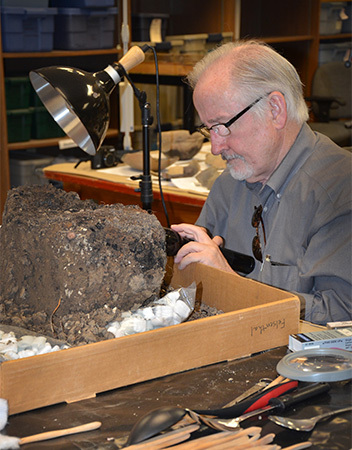 Professor David Stahle, a leading expert in tree-ring studies, examines the possible Parkin cross base. More earth science applications useful to archeology come from studies of the atmosphere and atmospheric phenomena that influence weather, climate, and other systems that occur on the earth’s surface. Weather refers to temperature, moisture (rain and snow), wind, and related conditions measured at a particular place over a short period of time. Climate refers to the cumulative, long-term patterns that prevail within regions over longer periods of time. Atmospheric phenomena have obvious impacts on a variety of human activities, such as food-getting, whether by hunting and gathering or agriculture. But how can we know about ancient weather and climate, and measure their impacts on humans? As it happens, there are a variety of indirect, or proxy indicators of past atmospheric phenomena. For example, the growth of tree rings is directly affected by soil moisture. The study of tree ring growth patterns through time, known as dendrochronology, thus provides one proxy indicator of changes in rainfall patterns. By studying living trees, very old trees dredged up from the bottoms of lakes and rivers, and even some archeological wood samples, Geoscience professor David Stahle (University of Arkansas), has been developing dendrochronology sequences for Arkansas and the mid-South that extend back for many hundreds of years. Graphs that display some of his results (based on what is called a Palmer Drought Severity Index) indicate that the Arkansas region experienced very severe and long-lasting droughts at many intervals in the past but especially during the late Mississippi and Protohistoric periods. The sixteenth-century Casqui Indians in northeastern Arkansas are among the large number of communities affected by those droughts. When visited by Hernando de Soto in 1541, the Casquins appealed to Soto to beseech his God for relief, and Soto commanded his men to erect a large cross upon the surface of the largest temple mound in their town (Hudson 1997). Priests accompanying the expedition conducted a Christian religious ceremony, and—according to written accounts—rain fell on subsequent days. Excavations have succeeded in identifying the location of the cross at the site, which is now preserved in Parkin Archeological State Park, and ongoing studies by Jeffrey Mitchem (Parkin Research Station) are examining the responses of the Casquins (known archeologically as the Parkin phase) to sixteenth-century social and environmental circumstances (Ethridge and Mitchem 2013). Even the science of astronomy can offer useful ways for archeologists to understand their data. Celestial mechanics—the motions of objects in space—may be applied to understanding archeological phenomena in Arkansas. This is because we moderns, with our large telescopes, are not the first people to have observed the heavens. A well-known study of the late Woodland period Toltec Mounds ceremonial center by P. Clay Sherrod and Martha Ann Rolingson examined the activities of Plum Bayou culture communities (c. AD 1000) in central Arkansas, who positioned a number of earthen mounds and an associated mile-long embankment to create an “astronomical observatory” on the landscape for monitoring the movement of sunrise and sunset at the spring and fall equinoxes (Sherrod and Rolingson 1987). We can’t be sure why Plum Bayou people invested in such a monumental effort, but one idea is that they were concerned to associate ceremonial cycles performed in their communities with events in Above World—the realm of powerful beings and forces. 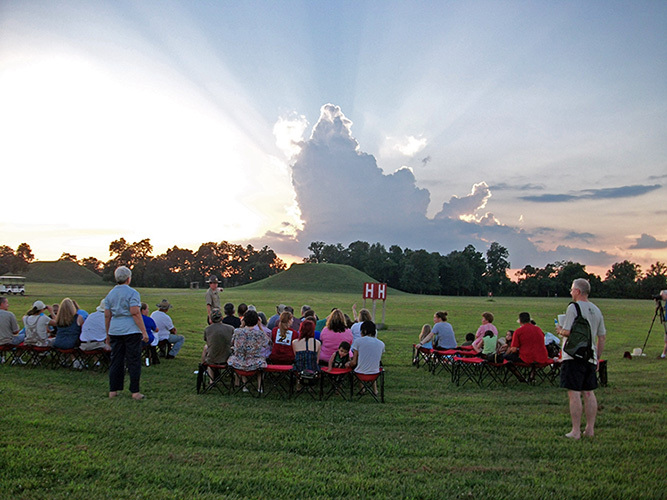 Visitors at Toltec Park Summer Solstice Program, July 2015. Photo by Steve Longacre. These are but a few examples illustrating how archeologists working in Arkansas have made productive use of earth science applications to better understand the history of human activity and experience in our state. Through ongoing studies, the future will provide even more examples of this productive interdisciplinary relationship. 2000 The Caddo and the Forest. In Forest Farmsteads, edited by Ann M. Early, pp. 93–110. Research Series No. 57. Arkansas Archeological Survey, Fayetteville. Trubitt, Mary Beth, Timothy K. Perttula, and Robert Z. Selden, Jr.
2016 Identifying Ceramic Exchange and Interaction between Cahokia and the Caddo Area. In Research, Preservation, Communication: Honoring Thomas J. Green on His Retirement from the Arkansas Archeological Survey, edited by Mary Beth Trubitt, pp. 87–102. Research Series No. 67. Arkansas Archeological Survey, Fayetteville. 1997 Knights of Spain, Warriors of the Sun. Hernando de Soto and the South’s Ancient Chiefdoms. The University of Georgia Press, Athens. 2013 The Interior South at the Time of Spanish Exploration. In Native and Spanish New Worlds: Sixteenth Century Entradas in the American Southwest and Southeast, edited by Clay Mathers, Jeffrey M. Mitchem, and Charles M. Haecker, pp. 170–188. The University of Arizona Press, Tucson. 1987 Surveyors of the Ancient Mississippi Valley. 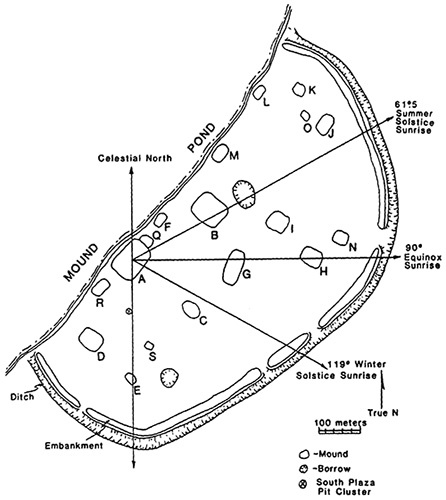 Modules and Alignments in Prehistoric Mound Sites. Research Series No. 28. Arkansas Archeological Survey, Fayetteville.